Humboldt State University will host its 10th annual California Big Time & Social Gathering on Saturday, April 1, 11 a.m. to 7 p.m. in HSU’s West Gym. 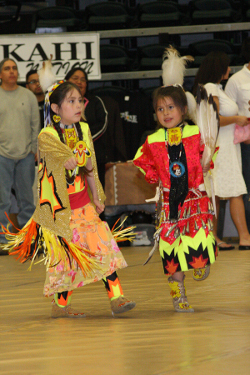 This public celebration of American Indian culture includes sharing of songs and dance from throughout California, an Indian Card Tournament, and cultural demonstrations. Founded on the principles of enhancing and sustaining Native languages, cultures, and traditions, HSU’s Big Time has provided our Native communities with a space to honor the ways of life and the values of our ancestors. 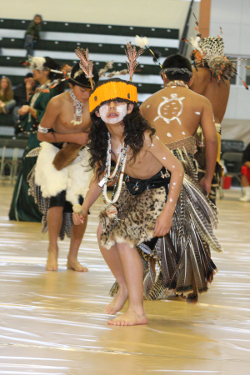 This year’s dance performances include a Flower Dance demonstration, Maidu Traditionalists, Northern California Brush Dancers, Red Cedar Drum, Southern California Inter-Tribal Bird Singers, SuNuNu Shinai Pomo Dancers, Tolowa Nation Dancers, and Tuolumne Me-Wuk Dance Group. Artists and vendors will also be on hand as well as food booths. The 2017 HSU Big Time is anticipated to gather around 1,200 people plus 70 businesses, services, and nonprofits for sharing and learning about ceremonial dances, regalia, songs, history, and traditions. The University’s Council of American Indian Faculty and Staff (CAIFS), Indian Natural Resources, Science and Engineering Program (INRSEP), Indian Tribal Education Personnel Program & Native American Center for Academic Excellence (ITEPP), and the MultiCultural Center (MCC) proudly host this event. The 10th annual California Big Time and Social Gathering is a free public event open to the community on Saturday, April 1 from 11 a.m. to 7 p.m. in HSU’s West Gym. For more information, please contact Paula Tripp-Allen at 707.826.5196 or PDT1@humboldt.edu, or visit our website at itepp.humboldt.edu/california-indian-big-time-social-gathering.